Set in the unpredictable world of Chicago politics, this drama follows the professional and personal life of the city's fictional mayor as he tries to do his job while suffering from the initial stages of dementia. The series stars Kelsey Grammer in the role of the mayor and Connie Nielsen and Hannah Ware as his wife and daughter. The series aired for two seasons in 2011 and 2012 on the Starz premium cable network. It was cancelled after its second season. Miller's published story could ruin Kane, but Kitty's alliance with Doyle could be equally threatening; Meredith enters a new relationship. Chicago's bankruptcy crisis decreases Kane's power as emergency measures are put in place, but threats by his enemies could ruin him forever. Kane hesitantly joins forces with a longtime rival on City Council but finds that something more drastic must be done to avoid bankruptcy. The alternative treatments appear to be working and Kane gains control of the city once again, but in his efforts to improve public perception, he may have to sacrifice a friendship. Tensions at the housing project escalate to chaos; Kane's past wreaks havoc on him when he quietly seeks treatment at an alternative clinic. As Kane's symptoms worsen, he struggles to differentiate between reality and hallucinations. Kane attempts to clean things up and gets rid of longtime political cronies. While at home, Meredith and Emma refuse a family reunion with him. Kane's increasing admiration for his new aide Mona gets him involved in a housing-redevelopment project. Kane uses a personal tragedy to his political advantage, which leads him to poach an aide from his nemesis and hire an ambitious newcomer. In the second season premiere, Mayor Kane's legacy is cemented with splendid groundbreaking ceremonies for the updated airport terminals. Though his political future seems bright, his health continues to be an issue. In the season finale, the race is much closer than expected on Election Day as Kane and Stone try to work their political magic. Meanwhile, Emma's world is rocked, and Meredith takes great measures to prove her loyalty to Kane. After his political image is injured, Kane decides to take a break from government; Kitty comes to an emotional crossroads; and Meredith, suspicious of Kane's extracurricular activities, seeks opportunities of her own. Kane and his camp confront the media when long-buried information is dug up, and with the primary rapidly approaching, the politicos do everything they can to maintain the upper hand. Kane's political and personal life continues to spiral down, and his supporters begin to lose confidence in him; Zajac's campaign llands him in new territory; and Miller digs deeper for some elusive answers. As Zajac's campaign starts taking off, Kane must adjust to his medical reality. Governor Cullen faces an embarrasing media storm while Miller stumbles upon a story that could have devastating effects. A new political force enters the race. Kane and his crew are desperate to stay ahead, but some worrying news fuels Meredith's suspicions that Tom is keeping something from her. Mayor Tom Kane has received news that he has a serious medical condition. However, his attention is on the upcoming gubernatorial primary while attempting to reconcile with his distant wife and estranged daughter. There are really only a few high-profile roll-outs left this fall season, as the networks start weeding their way through successful new offerings and DOA shows. One of the bigger premieres to hit the fall TV scene starts tonight, with "Frasier" and "Cheers" alum Kelsey Grammer poised to play the appropriately ruthlessly mayor of Chicago in "Boss" on Starz Network. 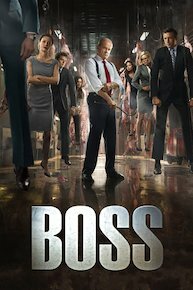 Boss is currently available to watch and stream on Starz. You can also buy, rent Boss on demand at Amazon, Hulu, Vudu, Starz, Google Play, DIRECTV NOW, iTunes online.